It wasn't so long ago that Steven Soderbergh was talking of retirement and the need to move on to something new. Luckily for us, the director is back with a film which is set to be one of his most well received to date. Yes Logan Lucky is yet another heist movie, and yes the jokes are a little on the predictable side, but make no mistake, this brilliantly well crafted and impeccably acted production was worth waiting four years for. Staring Channing Tatum, Adam Driver and an unrecognisable Daniel Craig, the film is everything any Soderbergh fan could have wished for and more. 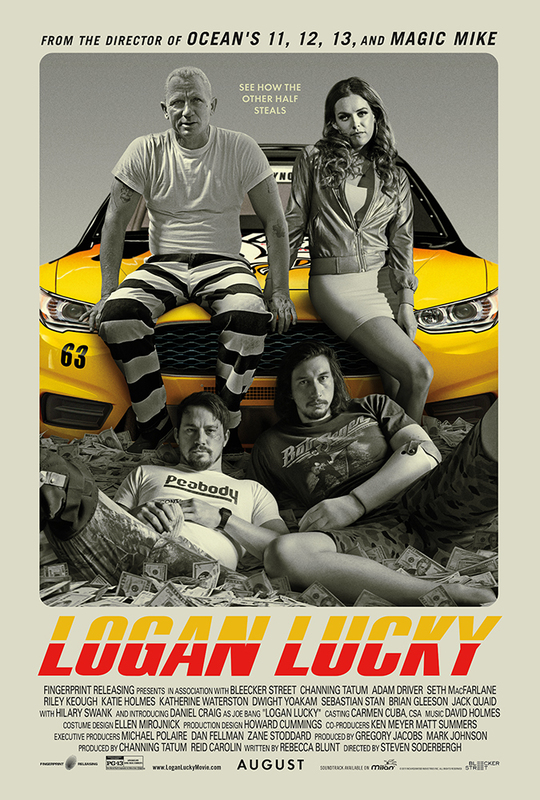 In fact, with its quirky characters of bumbling country folk and reckless misfits, Logan Lucky would certainly feel more at home alongside any Coen Brothers production than the average Soderbergh narrative. Jimmy Logan (Channing Tatum) was once a popular high school jock, admired by his peer and lusted after by the prettiest girls of his rural West Virginia town. However, as luck would have it, Jimmy’s career was dead before it even began due to a match injury. Now divorced from his childhood sweetheart with whom he has a daughter, and about to lose his poorly paid construction job, Jimmy can't shake off the infamous Logan bad luck he and his family seem to be suffering from. Fed up with his ex wife and her new husband’s constant badgering, Jimmy decides that the only way for him and his brother Clyde (Adam Driver) to get back at the world, is by staging a heist in order to rob the local NASCAR race vault. Hilarity ensues when the pair rope in, not only their hairdresser sister Mellie (Riley Keough), but also an incarcerated tattooed and bleached haired criminal Joe Bang (Daniel Craig) and his dimwitted brothers. The rest follows more of the same Soderberghian formula of arduous planning and intricate details. But don't let that put you off, because this is genuinely one of the director’s most fun productions to date. Tatum is extremely likeable, while Driver’s turn as the nice but dim brother is as good as any other Adam Driver performance. Logan Lucky is out on Friday 25th of August.